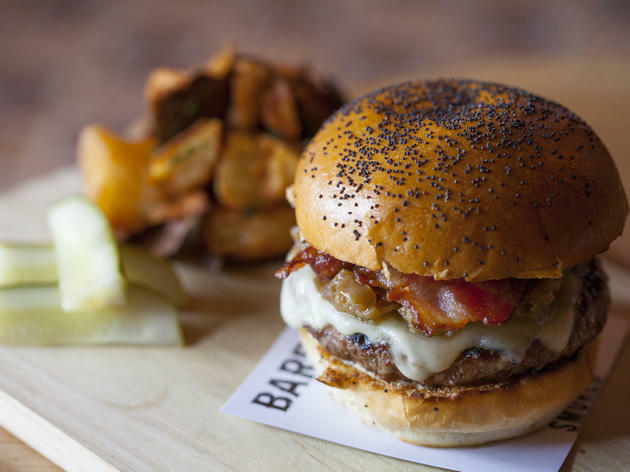 There's not much that can make a great burger even better, but fries? 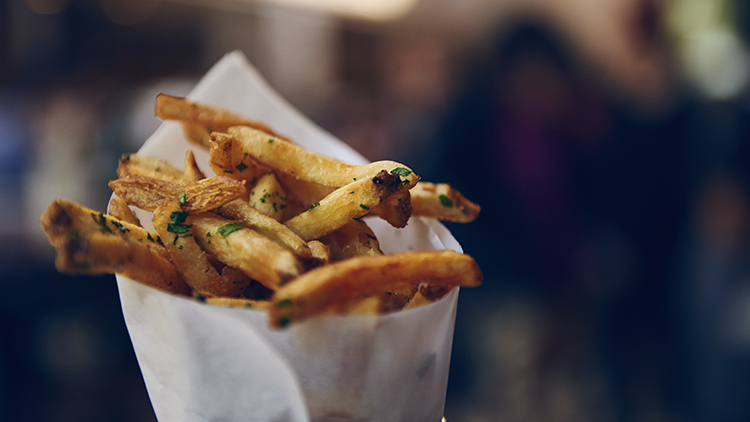 Fries definitely can. 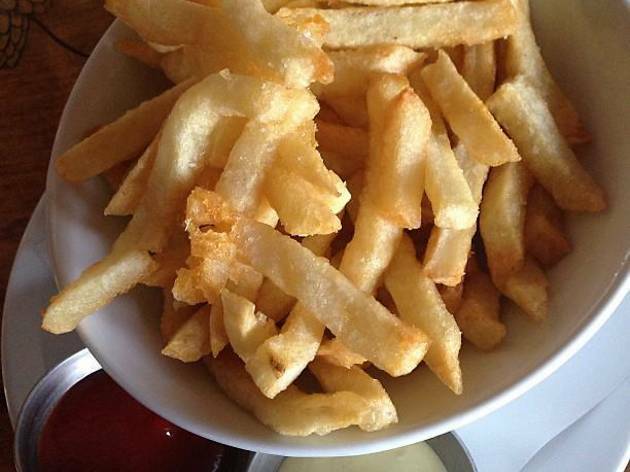 You know a good basket of French fries by the way you seem to start off eating just one fry, then quickly graduate to grabbing them by the fistful until all that remains is a sprinkling of salt and a smear of ketchup. 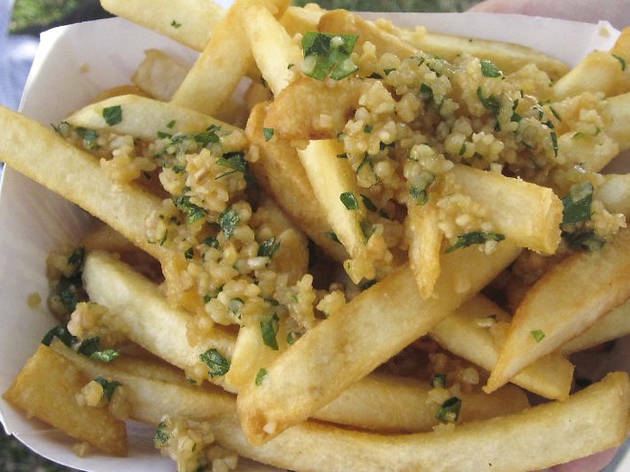 To find the best French fries in LA, we visited burger joints, food trucks, and even cocktail bars. 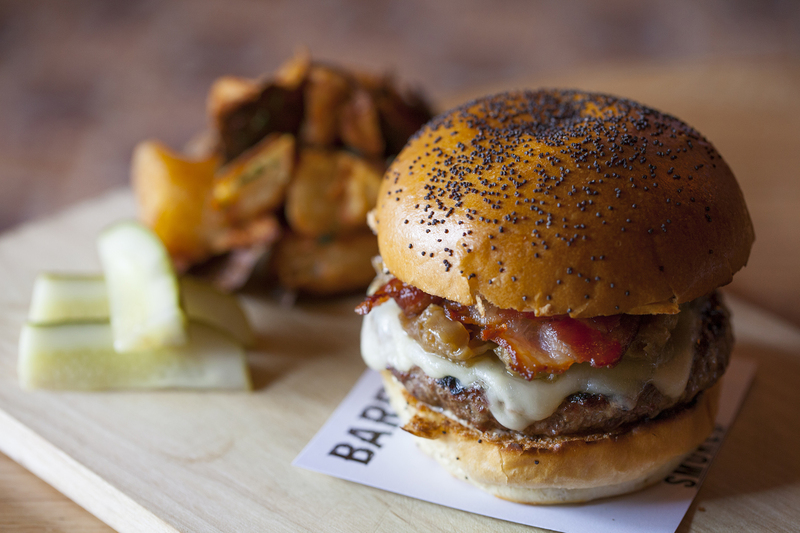 Our sodium levels may be at an all-time high, but we narrowed it down to these 10 picks. No regrets! What in God's name are these things? Fried to a crisp in duck fat, dusted with sweet onion sugar and tossed with duck skin cracklins, the Death by Duck Fries ($7) at Beer Belly are your doctor's worst nightmare. 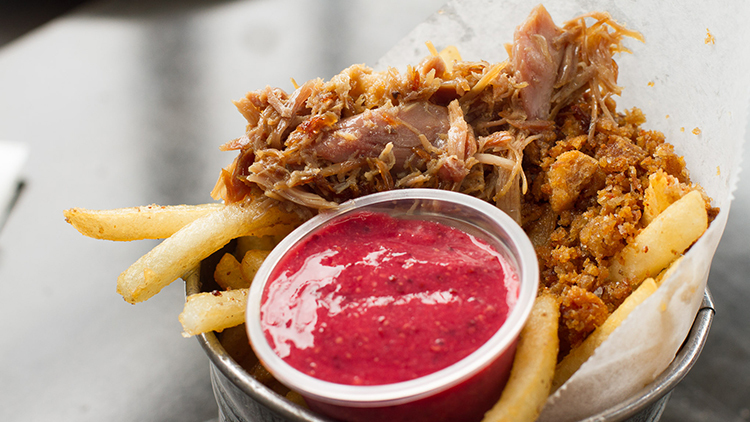 But it comes with a side of raspberry mustard, which has fruit in it, so that's healthy—right? We thought so. 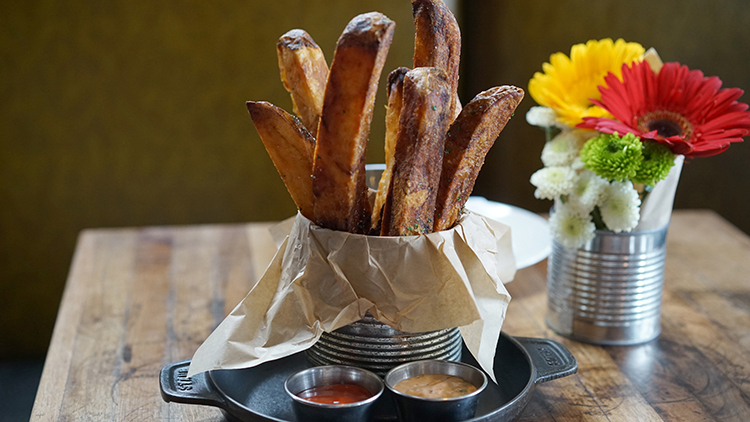 The pommes frites ($6) at Church & State—quarter-inch russet potatoes fried in lard—look simple enough, but the crispiness of these fries is pure perfection, as is the lemony aioli that comes with it. No judgment if you eat these by the fistful. 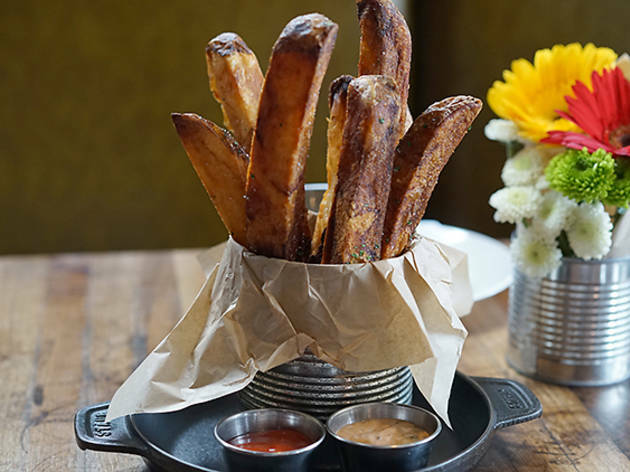 République has garnered attention for its kimchi fried rice, its decadent pastries and its phenomenal charcuterie, but no dish has caused as much fawning over as their French fries ($5). 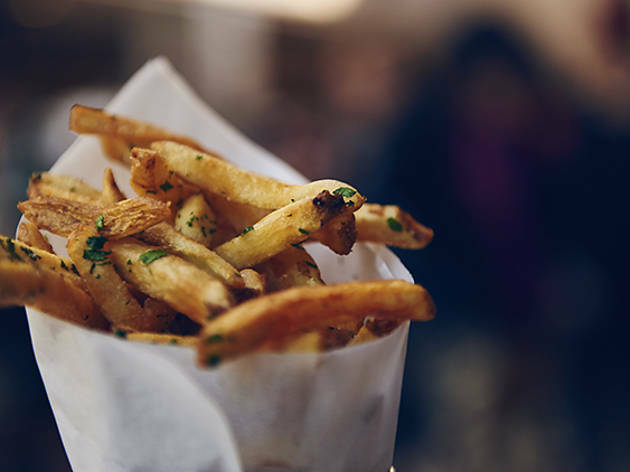 The thick cut strips fried in peanut oil arrive in an upright cone, like flowers jutting out from some kind of delicious, French fry-spawning garden. Dig in. Are these fries, or are these the fingers of some giant that lives at the top of a magic beanstalk? 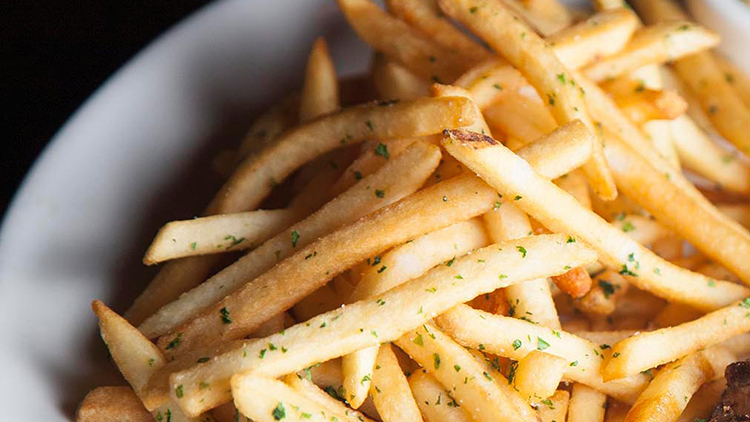 The Fee Fi Fo Fum fries ($7) at MB Post are one of the restaurant's most requested items, and for good reason. They're huge, they're addictive (probably because they're fried four times), and they come with ketchup and "fry sauce," which is made with mayo, chopped pickles and a smorgasbord of spices. 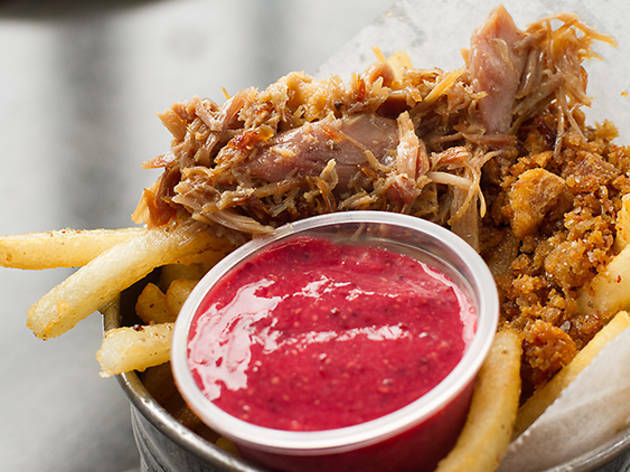 If you can catch this roving food truck, you're in luck. 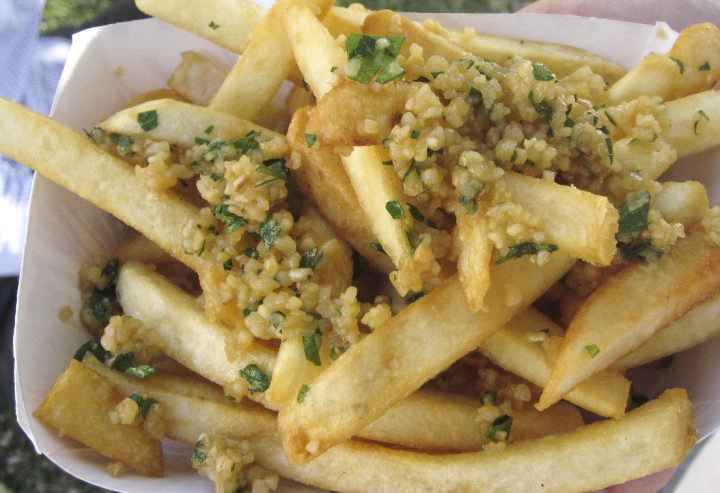 But don't necessarily get the sweet or savory crepes—a paper bowl of garlic fries ($5, though prices vary depending on location) is this truck's secret standout. 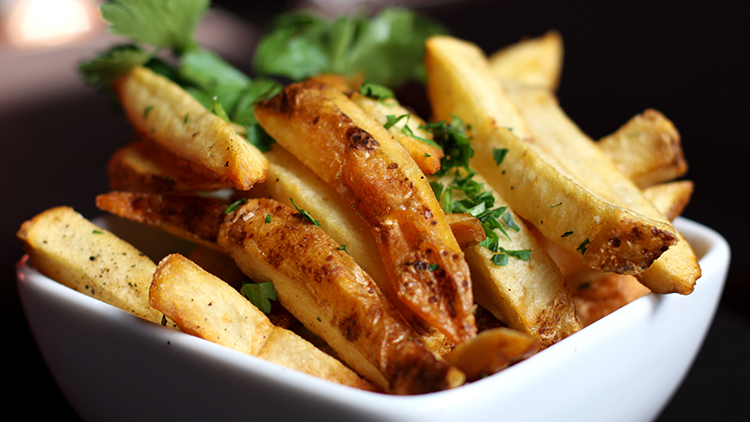 Huge chunks of garlic tossed with parmesan and parsley cover hot, crispy fries. Guard 'em with your life, because they'll be gone in a second. 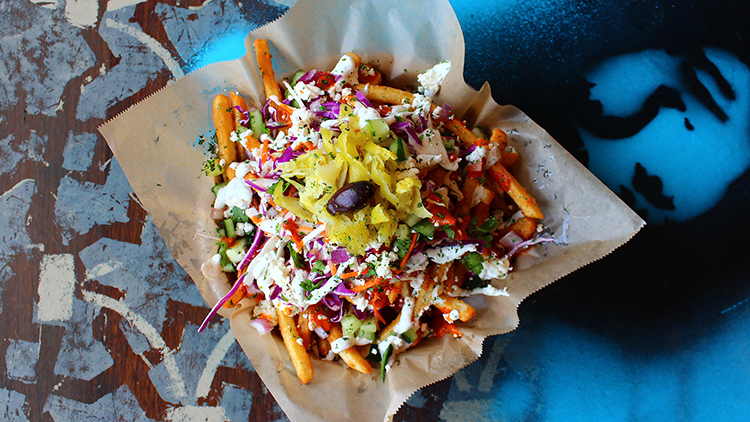 When you want to simulatneously curb your French fry cravings and feel like you're eating something slightly more complex, check out Spitz for their Street Cart Fries ($8.50). 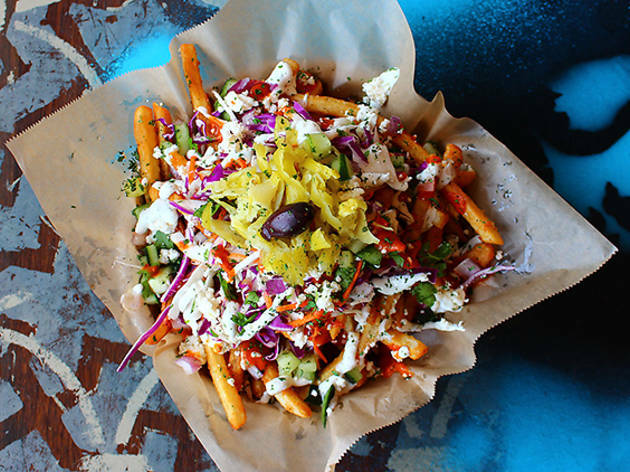 Crispy french fries are loaded with garlic, aioli, onions, green peppers, tomatoes, olives, pepperoncinis and copious amounts of feta. 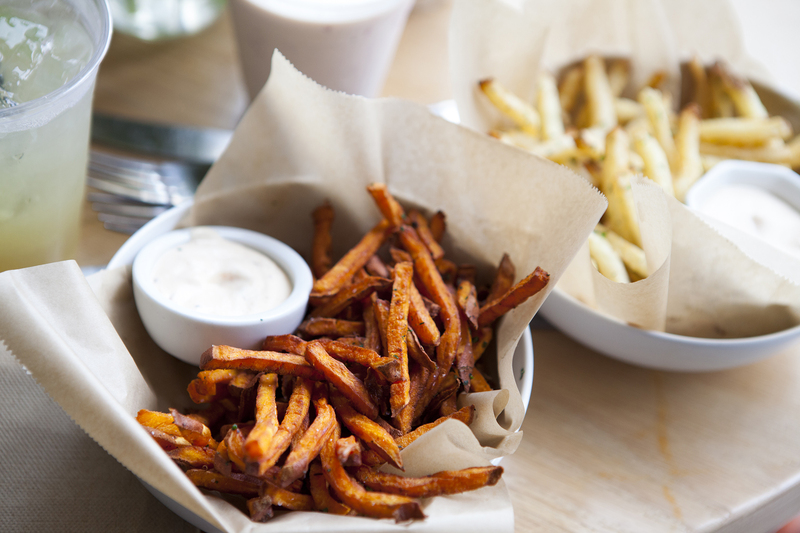 We had to include sweet potato fries on this list, and Pono Burger serves some of the best in town ($5). 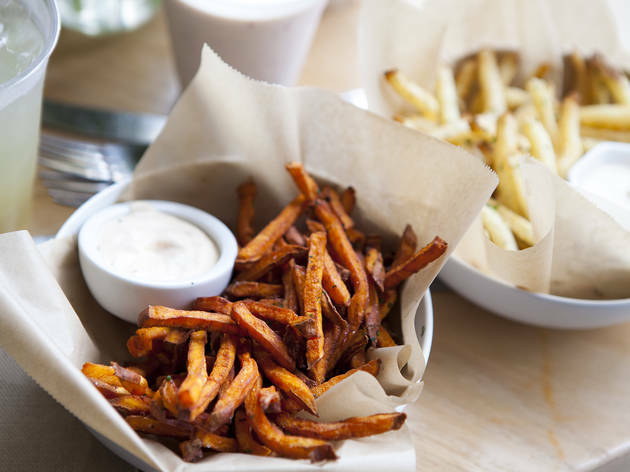 The organic, hand cut fries are tossed with fresh thyme and parsley, a dash of salt, and served with a housemade Niman Ranch bacon and chipotle aioli, which you'll find yourself dipping into again and again and again. Can you tell that we like garlic? 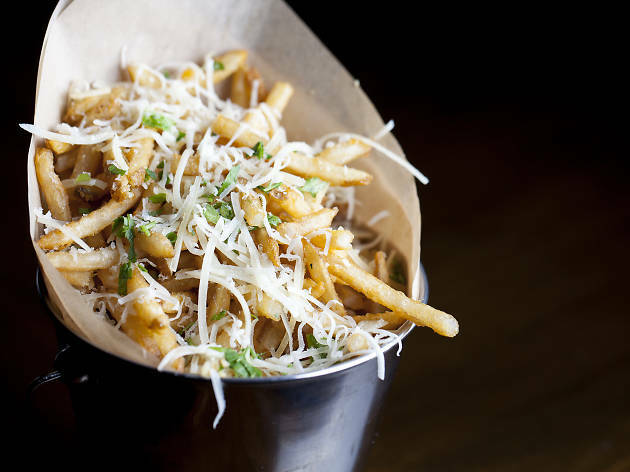 These thick cut house fries ($6) are tossed in the pungent stuff, but it's the house aged parmesan that really takes this dish up a notch. 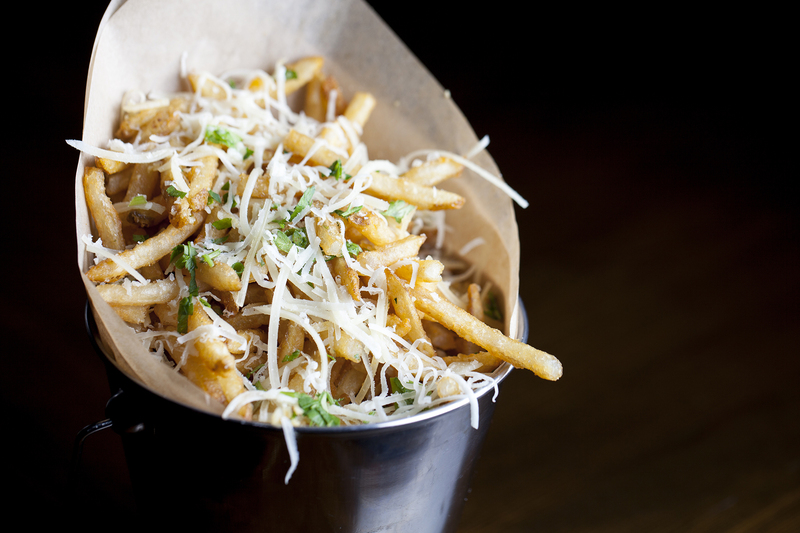 Order these fries at either the North Hollywood or Long Beach location. 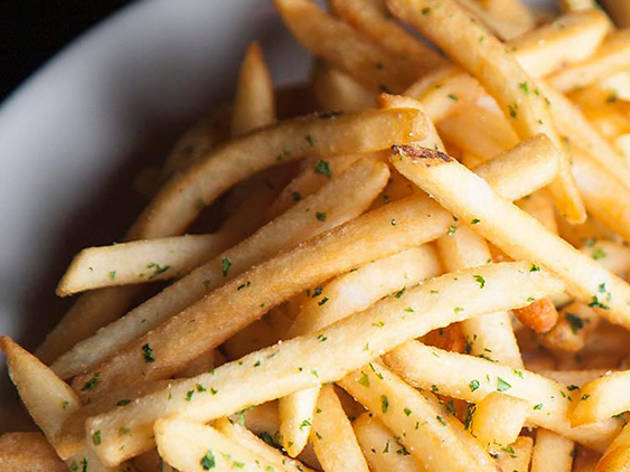 A cocktail bar in Hollywood may not be the first place you look for fries, but Lost Property has a few stellar options to choose from (all $5). 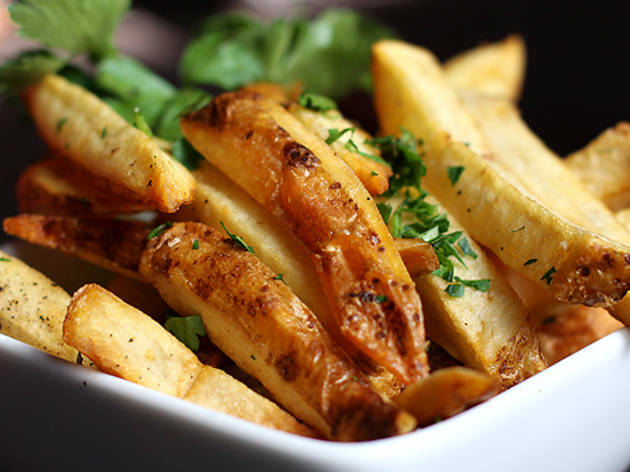 The garlic parmesan fries have a heavy dose of crushed garlic, fresh parmesan, parsley and "a little something extra" (nope, they're not giving it up), but just as addictive are the Cajun fries, which they sprinkle with their own in-house Cajun spice recipe. Sometimes it's the sauce that makes it. 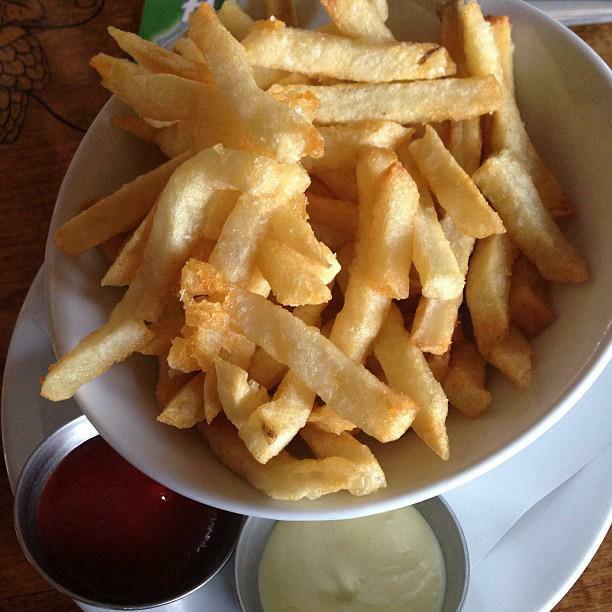 At Little Bear, the crispy, golden and uniformally cut Belgian Fries ($5) don't look like anything special. Yet they arrive with not just ketchup, but a side of garlic aioli so addictive that you'll push that ketchup to the side in order to have more room for aioli dunking. Want a burger with those fries?